The two giants on this list are Wusthof and Shun, premium steak knife makers that have made a name for themselves in the industry and continue to go strong. The best steak knife is one that holds its edge well and does a clean cut, but one that also doesn’t rust, stain, or break easily. There are plenty on this list to choose from, with the biggest surprise being the fantastic quality of one of Wusthof’s budget sets. A good steak knife and the set will last a lifetime, as well as the memories created from it. There are plenty of ways to choose, but the best will usually be the one that fits your kitchen and is back well by the maker. The second item on the list is a well-priced Gunter 7 piece set, with the 7 referring to the wooden caddy it comes in. This is actually a 6 steak knife set with blades made of 440c German steel that not only holds a great edge, but resists staining. The handles are pakkawood with full triple tangs, comfortable enough but functional enough to make them one of the better ones on the list. A lifetime warranty is included, and the knives can often be seen being demoed at stores. What makes this set unique is that the block can attach to either an 11 piece or 12 piece set, making it a lot more functional if users choose to stay within the same brand. The sets are models 201 and 250, and are easy enough to find much like the original. The knives are hand wash only, which is a bit of a letdown, but considering the quality and weight of the knives it is a not a major hit. This set is easy to find everywhere and is one of the more competitively priced sets on the list. This is not the best on this list, but it is a very good deal that everyone interested in steak knives should look at. 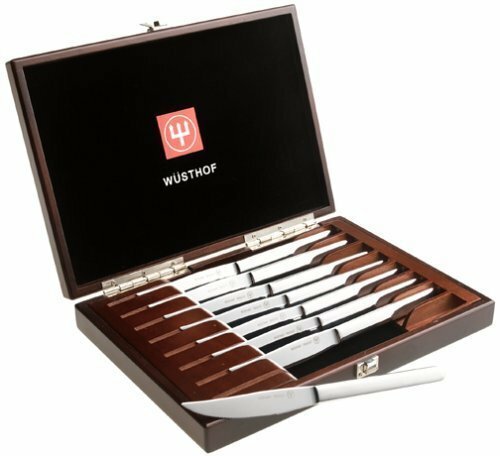 Wusthof strikes on the list again, this time with the Wusthof Classic 6-Piece Steak Knife Set. This is definitely one of the more beautiful and functional knives on the list by a longshot. The knives have a 4 ½ inch scimitar-like blade giving them superior performance when used on meat. Besides being one of the best looking sets the knives are also one of the sharpest, and the entire set is dishwasher safe. The blades are high-carbon stainless steel held together by a traditional composition handle that is triple riveted, giving the user superior control and power when in motion. The lifetime guarantee will almost certainly not be needed, but is a nice touch. This is one of the more expensive knives on the list much like the previous Wusthof. The difference in this set is almost night and day, as the Wusthof Classic 6-Piece Steak Knife Set is pretty much the standard for how to make steak knives. This set can’t be recommended highly enough, and in most cases will outlast the user. Some users report using them for over a year and not even needing to sharpen them. If looking for a premium steak knife set that will last a lifetime, then this is it, and comes highly recommended as one of the best on the list. Wusthof doesn’t just dabble in premium knife sets, but budget knife sets as well. 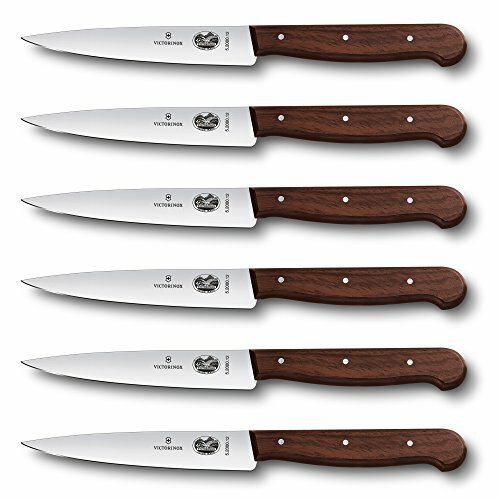 The Wusthof Gourmet 6-Piece Steak-Knife Set is a lower priced item on their list that features 6 4 ½ inch steak knives stamped from high-carbon steel. The blades themselves have a stain resistant alloy, and include no bolsters as they are tapered from base to tip. The knives are dishwasher safe, like all Wusthof products, but hand washing is recommended. Whereas the premium knives in the line had a full lifetime warranty, this one includes a limited lifetime warranty. Users will get mixed results on the set, based on how they care for these knives. They are definitely not dishwasher safe, and the blades lose their edge a lot quicker than expected. These knives are also not serrated, and the quality of the set is all but diminished as the Wusthof symbol on the handle will eventually fade after repeated washings. There are some people who prefer fine edge to serrated, but the low quality of these knives, even if a budget set, does not look good for such a quality name. Definitely one of the worst on the list, and even at the current price, should be avoided. 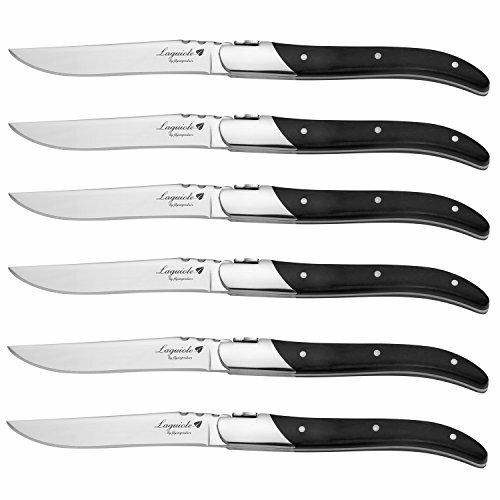 Also on the budget line is this 6 piece 4 ½ inch knife set with wavy serrated edges and rounded tips. The blades are of good quality for the price, and are stamped stainless steel made to preserve their edge. The handles are NSF-approved, and although they don’t look anything special, are quite comfortable. Hand washing is recommended, and if cared for, this set won’t need to call in the limited lifetime warranty. The blades are made to be resharpened and maintain their original sharpness, and although not of premium quality, they are very good blades. The handle was made with great care, and is a sure grip with a finger guard that minimizes crevices where bacteria may collect on knives. This is an incredible deal considering that this is a budget knife that wasn’t meant to go up against the big boys. But it actually does a fairly good job of that, even if that wasn’t their original intention. This is one of the best knives on the list, and it is amazingly a budget set. 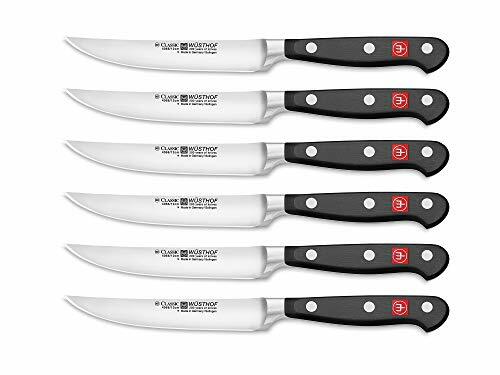 The Victorinox Cutlery 6-Piece 4-1/2-Inch Wavy Edge with Round Tip comes highly recommended and is one of the tops on the list. Jumping back on the premium steak knife bandwagon will be this 4 piece set of 5 inch steak knives. The Shun DMS400 Classic 4-Piece Steak-Knife Set is the first set on the list made in Japan, and is forged by renowned blade manufacturer KAI. The blade sports 33 layers of stainless steel and is as close to rust proof as you can get on this list. The handle is Pekkawood and in a D shape for comfort and ergonomics while the end-cap is made of a high quality steel. From top to bottom this is one of the higher quality knives on the list, but unfortunately only comes with a limited lifetime warranty. The blade has a VG-Max steel core surrounded by the aforementioned layers of steel known as Damascus, which protects the blades over the years and helps keep its edge. This is the prettiest set on the list, and also one of the more expensive sets as well. The only downside is the limited lifetime warranty, which is a bit of a letdown as this is a premium knife set. As it stands, this is still one of the top three knife sets on the list and a worthy buy. 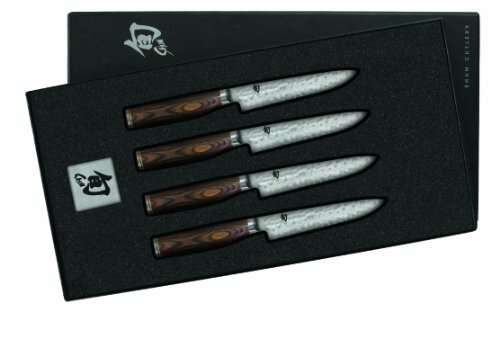 Laguiole Style Knives Flying Colors Steak Set is a 6 piece set of 9 inch 3cr14 stainless steel knives in a black color wood box. The handles are very stylish, and are made of wood that goes well with the overall box presentation. This is definitely not dishwasher safe, and hand washing is recommended. The box material is beech wood, which holds up well over time and looks as good as it feels. The set is presented through marketing as a gift, and from that point of view, it actually looks very inviting. The problem with this set is that it is cheap and very poorly made, from the blade keeping its sharpness to the wedges where the handle is. This set will dull quicker than any set on this list, and the handle is one of the most uncomfortable one the list, if not the most. When considering the best steak knife, this would not make the list. This set as a gift, however, is convincing for the price offered. But for a little bit more users can gift a budget Wusthof, and avoid losing the favor of a friend. 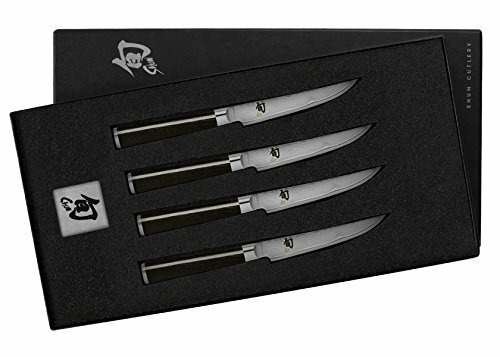 Shun offers this 4 piece set of 5 inch steak knives made from VG-10 stainless steel, surrounded by 32 layers of high-carbon stainless steel for rust resistance and to keep a better edge. The blade angle is incredibly sharp at 16 degrees and because of the layered steel will hold that edge for years. Once again Shun has some of the best looking and performing blades on the list, but it is hand wash only and comes with a limited lifetime warranty. The handle is great as well, and is the standard Pekkawood D shape that Shun is famous for. This set is on the upper tier of the price point, but is an incredible 4 piece set. Shun is really at the top of the market when it comes to quality, even if they are lacking a competent warranty or Wusthof’s ability to be dishwasher safe. These blades are thin, strong, and remain sharp for years. This is the definition of a premium steak knife set, and can easily destroy most of the knives on this list. The price is up to the buyer, and whether they want to spend this much on a product with a limited lifetime warranty. Most of the sets on the list concentrated on being cheap and badly made or incredible and high. The Victorinox 4-3/4-Inch Straight-Edge Pointed-Tip Steak Knife is the first set on the list that truly gets the balance of premium knife set and price correct, containing a set of 6 straight edged pointed tip steak knives made out of carbon stainless-steel blades. Edge retention is high, and these blades hold well over use if cared for properly. The riveted rosewood handle is one of the best on the list and has bolsterless edges for usability and sharpening purposes. Made in Switzerland, this set has a lifetime warranty against manufacturer defects. Easily one of the best on the list, and favorites of many professional reviewers. This is almost the perfect balance that one would expect from a steak knife, and it is made to last. The only downside is that the set does not come with a proper block, and may require an extra purchase if a compatible one isn’t already in the kitchen. This is a top three set on the list, and worth every penny to anyone who chooses to buy it. This is the 4 piece set of the previously mentioned Wusthof Gourmet 6-Piece Steak-Knife Set, and as with the first one, it is a bit of a disappointment. 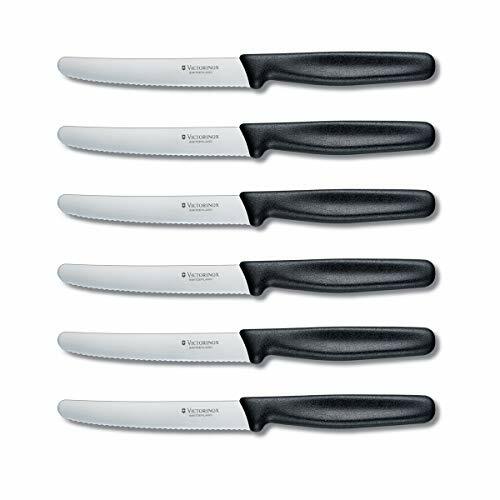 The set has four 4¾ inch knives made of high carbon stainless-steel encased in a full tang 3-rivet poly handle. They handle very well, but just aren’t built for the long term user. They are dishwasher safe, but more prone to damage than the premium set, so hand washing is recommended. If choosing a non-serrated blade this isn’t a bad choice for the 4 piece set, but it’s hard to give a full recommendation based on the lackluster durability of this line. The classic line literally can crush this line without blinking an eye, and has a lifetime warranty to boot. This will get the job done, but will definitely require lots of care in order to maintain for years. As it stands, these knives are not one of the best on the list and are definitely meant to be replaced after about a year or two of use. As an 8 piece set, this is the best bargain on the list, but also the lowest quality. The edges are micro-serrated and forged from a single piece of stain-resistant steel. The triple riveted handles feel good in your hand, for power, grip, and comfort. The set is listed as dishwasher safe, though hand washing is recommended. The general makeup of the set is made to resist corrosion, but no more than any budget set in the same range. The 8 piece set is backed by a Henckel’s Lifetime Guarantee, although there have been some complaints about taking advantage of that. 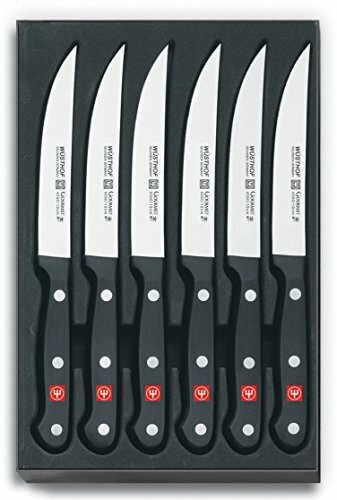 The set is listed as steak knives, but in truth it is a multifunction set of 5 with the remaining being a 3.5 inch paring knife, 3 inch vegetable knife and 2 inch peeling knife. The handles are made of plastic, but surprisingly hold up well on long uses. This is made as a starter set of sorts, and although not the best steak knife set on the list, may have a place for other uses. How it will fare over the years is another story, so users may want to look elsewhere when choosing a steak knife set. 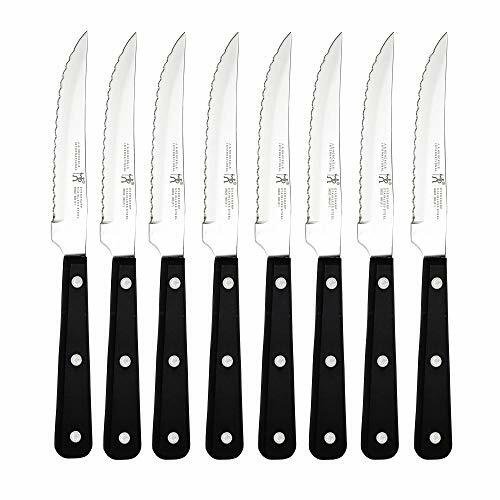 The Wusthof 8pcsteak 8-Piece Stainless-Steel Steak Knife Set is much like the previous J.A. Henckels set, only good. The price is incredible, and unlike its other previous budget offerings, the knives seem better suited for the tasks. 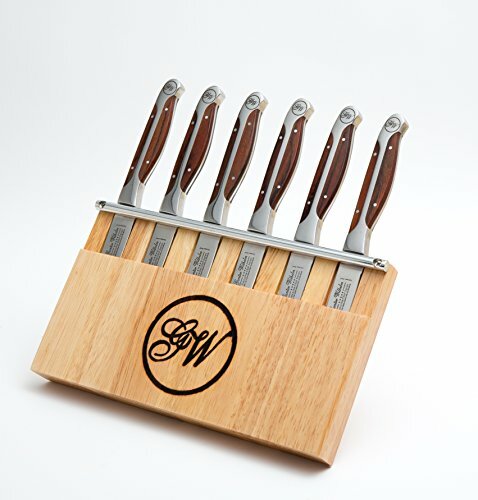 The 8 knives are set in a mahogany stain presentation box, while the serrated blades are made out of high-carbon 18/10 stainless-steel. This blends in beautifully with the polished stainless steel handles, for a 1 piece precision-forged finish. Unlike Wusthof’s other budget offerings, this one contains a lifetime warranty. The entire set looks and feels even better when cutting, and should not be bunched with their other budget offerings. This is one of the best deals on the list, and one of the best steak knives users can buy for the price. The set comes highly recommended, both as a gift, and for home use. 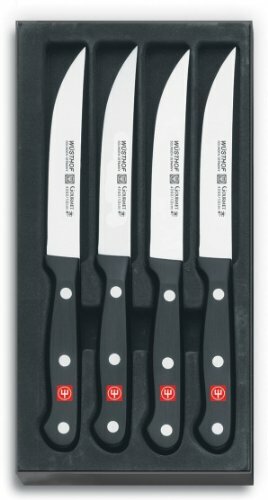 This 6 piece German made set, which is also available in 4 and 8 piece variations contains 4.5 inch micro-serrated blades that never require sharpening. All knives are full tang carbon stain resistant steel with bolsters that actually enhance the look of the knife itself. The handle is one to marvel at, as it is triple-riveted and made of polyoxymethylene, making it resistant to fading and discoloration. Along with the lifetime warranty, it comes with a beautiful walnut presentation storage case that will definitely wow the guests. This is a high quality set, at a very high price. Considering that this is the 6 piece set, even if it is from the renowned Wusthof, it exceeds what a quality 8 piece or even higher set would cost. The knives themselves are incredible and built to last, and anyone who makes a purchase should be prepared to pass these down to the next generation, as they are built to last. Whether the starting price is worth the cost of admission will be completely up to the buyer, and whatever set they need.